Let’s all rally together to keep our children in the education forefront! Support projects that go beyond the State and PTSA budgets. To produce independent learners and community leaders of tomorrow, by perpetuating a culture of excellence and success through updated experiences and opportunities for our Ma'ema'e School Community. 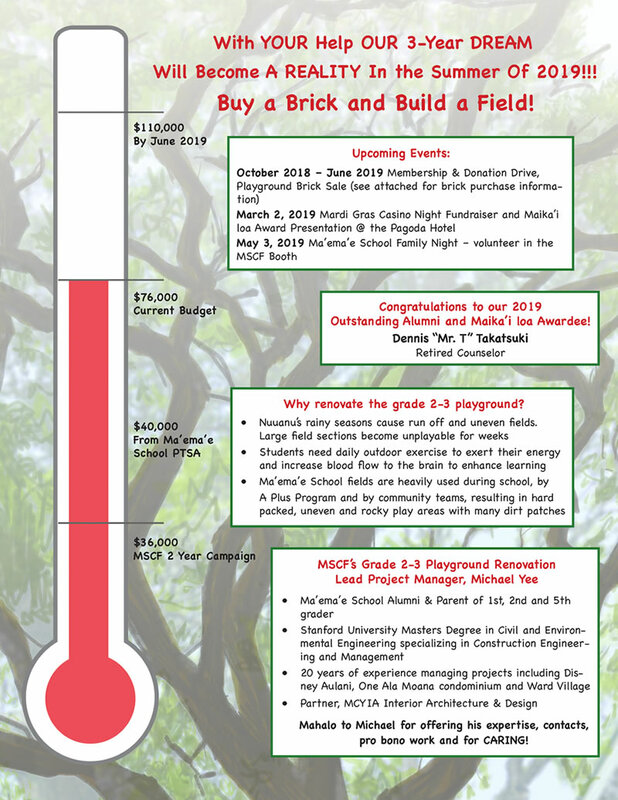 Net proceeds from this event will help fund improvements of the Ma'ema'e School's grades 2-3 playgrounds. Or maybe your children grew and blossomed under Ma’ema’e’s caring and experienced educators and staff? Or perhaps you were part of Ma’ema’e’s vast learning community, leading our children toward excellence? These fond academic memories were the essence of our school’s founder, Elizabeth “Mother” Waterhouse, back in 1897. Remember the good old days under the shady monkeypod trees when life was carefree and learning was fun? 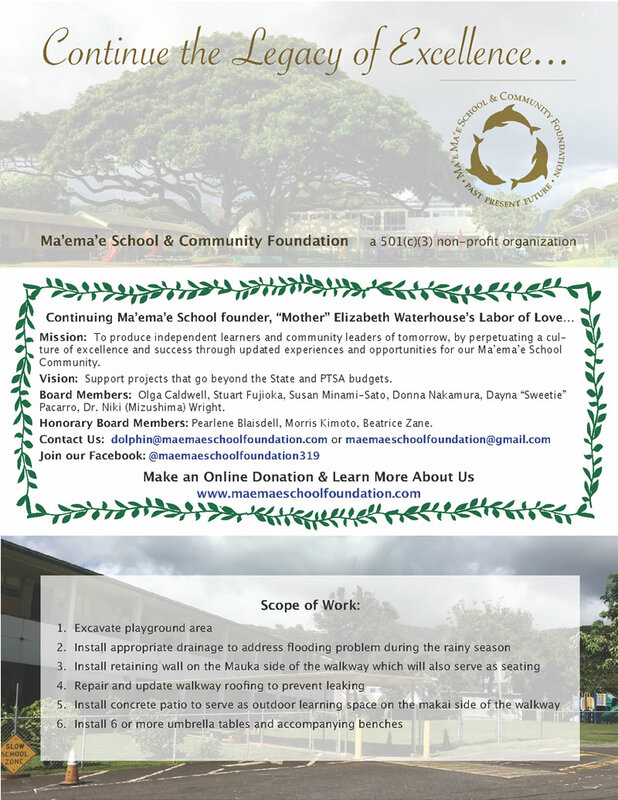 The newly formed Ma’ema’e School & Community Foundation (MSCF), a 501(c)3 non-profit charitable organization, allows all of us to continue Mother Waterhouse’s “labor of love”. 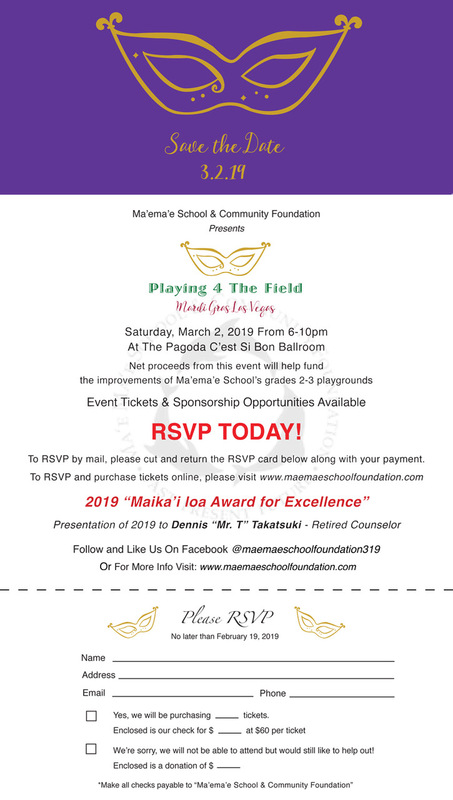 Renew your connection with Ma’ema’e School, to support needed experiences and opportunities that will continue to guide our students into productive leaders and citizens of tomorrow! Fund necessary technology tools so students can keep up with global expectations and demands. Fund capital improvement projects which promote safety and and productive learning environment. Fund teacher professional development to enrich classroom learning experiences.